What’s Tray cooking up during the second season of The Last OG TV show on TBS? As we all know, the Nielsen ratings typically play a big role in determining whether a TV show like The Last OG is cancelled or renewed for season three. Unfortunately, most of us do not live in Nielsen households. Because many viewers feel frustration when their viewing habits and opinions aren’t considered, we’d like to offer you the chance to rate all of The Last OG season two episodes here. A TBS sitcom from creators Jordan Peele and John Carcieri, The Last OG stars Tracy Morgan, Tiffany Haddish, Allen Maldonado, Ryan Gaul, Taylor Mosby, and Dante Hoagland. 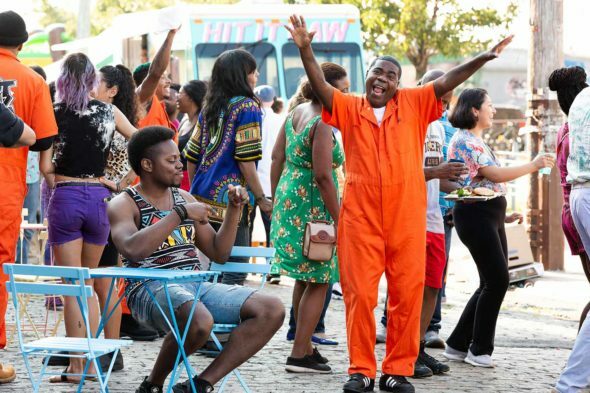 Season two guest stars include Method Man, Rev Run, Talib Kweli, Rakim, Bresha Webb, Diarra Kilpatrick, Anna Maria Horsford, Joshua Rivera, Dan Hedaya, Brian Sacca, and Jack McBrayer. The comedy centers on Tray (Morgan), who is released from prison after 15 years. Back in a now-gentrified Brooklyn, he finds his old love, Shay (Haddish), has married a white guy. What’s worse — she and Josh (Gaul) are raising the teenaged twins (Mosby and Hoagland), Tray never even knew about. In the second season, after losing his job, Tray decides to pursue his dream of becoming a chef.